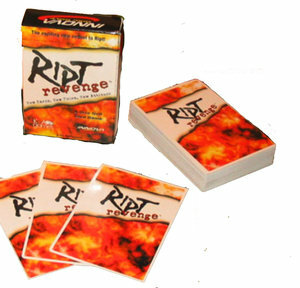 In 2004 KnA Games created the Ript Disc Golf Card Game and the sequel Ript Revenge followed in 2006, providing an enhancement to the sport of disc golf. Ript and Ript Revenge are played by a group of golfers during a round of Disc Golf. These games creates a truly unique Disc Golfing experience and provide practice on shots that would not have been taken otherwise.